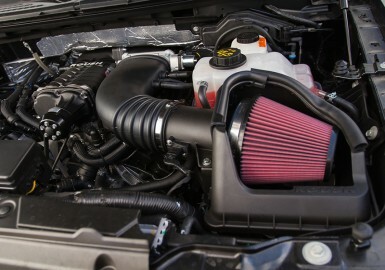 Fits 2011-2014 5.0L and 6.2L F-150’s equipped with a ROUSH Supercharger System that came with the Upper (large) LTR. 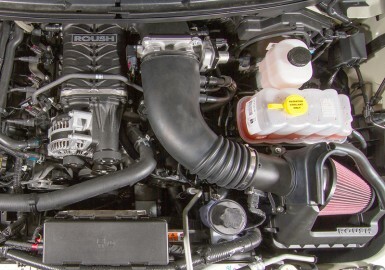 Note: Some 2011-2014 5.0L & 6.2L F-150 ROUSH Superchargers came standard with this LTR already. If this LTR came standard with your supercharger, please refer to Part #421742 for an upgrade to your cooling system. Please contact our sales team if you are unsure which Low Temperature Radiator you have. Simple add-on kit to integrate with the ROUSH Upper (larger) LTR systems, which come standard in all newer 5.0L & 6.2L F-150 ROUSH Supercharger systems. Stay cooler longer with dual low temp radiators! This ROUSH Low Temp Radiator Upgrade (Lower LTR) is designed specifically for those owners of 2011-2014 5.0L and 6.2L Ford F-150’s equipped with a ROUSH R2300 Supercharger and Upper (large) LTR. The ROUSH Lower LTR is a simple add-on kit that seamlessly integrates with the current, large-face upper LTR. Dual LTRs provide more efficient air cooling by increasing the heat transfer surface area, which results in lower intercooler water temperatures and provides superior air charge cooling. Adding the Lower LTR brings the total surface area to 422 in. sq. and also provides 1 qt. of additional cooling volume, leading to lower inlet temperatures. ROUSH engineers spent many hours developing and testing this lower LTR to achieve maximum temperature reductions. During wide-open throttle runs, the manifold charge temperatures were reduced when running the dual LTR set-up. If you want the maximum cooling capacity and efficiency possible, you can also upgrade your (already present) large upper LTR to ROUSH’s even higher-capacity LTR (part #421742)! This kit is protected by the ROUSH 90-Day Limited Warranty (ROUSH supplied parts only) from date of purchase.